Throughout the month of July, and during the Open House Melbourne July Weekend, ACMI hosts Modernism at the Movies—a bill of films that explore the world of modernist architecture in Australia and across the USA. The second season of Modern Melbourne films, created in conjunction with Culture Victoria, will be presented. 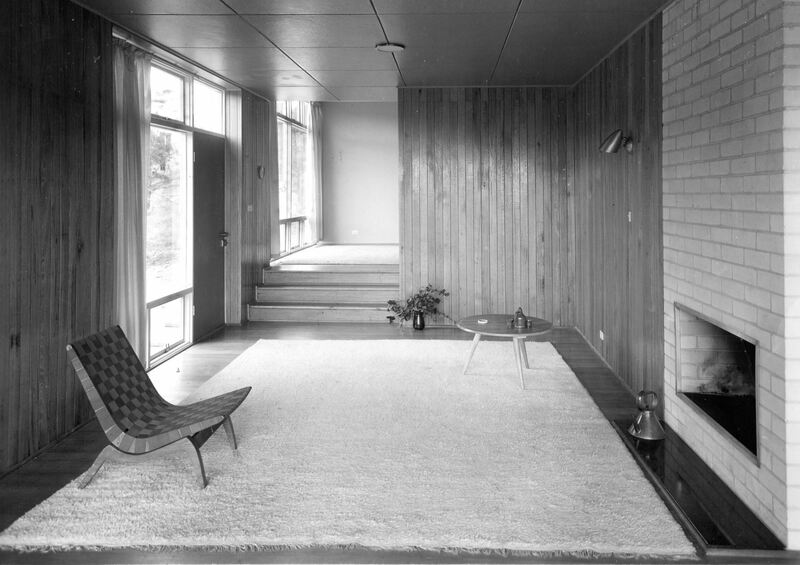 Modern Melbourne celebrates a series of interviews and related archival material that document the extraordinary lives and careers of some of our most important architects and designers. This year, we had the esteemed pleasure of interviewing Phyllis Murphy and Alan Powell. Two new Modern Melbourne interviews with subjects Phyllis Murphy and Allan Powell. Phyllis Murphy, along with her husband John, joined forces with rising young architects Kevin Borland and Peter McIntyre and engineer Bill Irwin to enter the 1952 competition for the design of the new Melbourne Olympic swimming pool. Their design won, and, once built, the structure became one of the city’s icons of modern architecture. While the swimming pool was to remain the design for which the couple were most famous, their practice continued to produce the modest scale domestic interpretations of modernist design for which they had become known, along with some larger industrial projects. Allan Powell graduated in architecture from the University of Melbourne in 1974 and gained a Master of Architecture degree from RMIT University in 1992. He worked for Guilford Bell (1971-6) before establishing an independent practice under his own name in 1980. Powell is a noted design architect whose practice has made a major contribution to the quality and style of Melbourne residential, commercial and educational buildings. He has designed numerous houses, mainly in metropolitan Melbourne and on the Mornington Peninsula. Modern Melbourne is produced by Open House Melbourne and made possible by the generous support of the Heritage Council of Victoria and the Victorian Government through Creative Victoria. Visit here to view the extended filmed interviews and other rich archival material. Narrated by Dustin Hoffman, Visual Acoustics celebrates the life and career of Julius Shulman, one of the world’s greatest architectural photographers, whose images brought modern architecture to the American mainstream and a global consciousness. When a renowned architecture scholar falls suddenly ill during a speaking tour, his son Jin (John Cho) finds himself stranded in Columbus, Indiana – a small Midwestern city celebrated for its many significant modernist buildings. Jin strikes up a friendship with Casey (Haley Lu Richardson), a young architecture enthusiast, and their intimacy develops. Eric Saarinen, director of photography and son of acclaimed and influential American architect Eero Saarinen (1910-1961), visits the sites of his father’s work on a cathartic journey, shot in 6K with the latest in drone technology that showcases the architect’s body of timeless work for the first time. A film rich with Saarinen’s iconic, groundbreaking designs, it also features rare archival footage and letters from Eero’s second wife, The New York Times art critic Aline Saarinen.